Yet another game that was sadly to be caught up in the demise of Hi-Tec Software back in 1992. 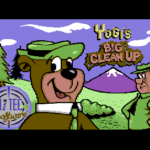 This was to be a 3rd Yogi Bear game from the company, and was only really known about for the C64 when listed as a competition prize in the Daffy Duck compo in Zzap. The game was fully released on the Amiga (http://hol.abime.net/1649) and ST. The C64 edition was a conversion that was being done by Ashley Routledge and Dave Saunders, started approximately as Daffy Duck was nearing completion. 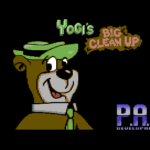 Yogi featured in your typical platformer, spanning across 4 levels where he must tidy up rubbish in Jellystone Park, find parts of a bike in the swamp, find objects for different characters in the film studio and then conclude by trying to find all the pieces of his bed in the underground caves. Borrowing from their previous code libraries, it didn’t take long until the conversion was almost complete. The underwater section had been dropped, but otherwise it was all mostly there. Things just needed stitching together, bug fixing, an end sequence produced and tunes composing by someone. 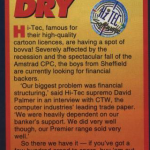 Unfortunately, just before this could all happen – Hi-Tec went into financial trouble, and the game was caught up in the mess. David Palmer attempted briefly to launch a new publishing arm, by launching a Citizen Software label in early 1993 which would support 8-bit and 16-bit platforms. Ash and Dave span up work yet again on Yogi 3 to try and do a bit more work, and changed the titles a bit in preparation. However, it was decided at that point to move away completely from the 8-bit platforms and concentrate purely on console developments. Daffy and Yogi both could have almost snuck out after all! 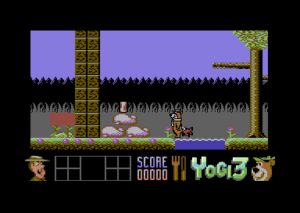 As with Daffy, Yogi 3 was to sit on its development disks for many years – until in 2015, the complete source code and assets were recovered in PDS format after borrowing Ashley Routledge’s work disks. Around the time that Daffy was being pieced together, Yogi 3 was also compiled to see what was there – but found to be very broken in places and nowhere near as complete as Daffy Duck. Over the past year and on and off, Martin Pugh has carefully pieced the game together – using the Amiga/ST version as a reference point, with much testing carried out. Each level was at the start was essentially a separate component, not linked at all in any way. Much of this work was yet to be done, and Ash and Dave hadn’t had chance to do so. There were many bugs that prevented picking up and dropping items that needed to be fixed, especially on the Swamp level. 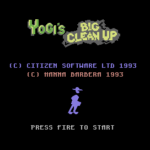 The rooms which Yogi could enter on Level 3 had not been properly patched in, so this was done, so the level could actually be played and completed. Level 4 had some heavy glitches, which most have now been fixed. Although there still are a few minor glitches for the colour scrolling, the game is now at last fully playable – and all 4 levels have been linked up. Even the code for level completion, game over and level linkup + loading wasn’t present and had to be coded in. The title screen and high-score parts were partially there, but needed to be linked up and score entry + saving code developed. Music was sadly nowhere to be seen, and likely not to have been composed at all. No doubt it would have been done by Gerard Gourley. There would luckily be SFX included in the game, created by Ashley Routledge. Crucially though – although a loading screen was present, there was no ending screen or any reference to an ending in the code. Ashley had not got round to doing one. Sadly Ash was too busy to produce a new one, so we asked Steven Day if he would produce one instead. Luckily Ste very kindly agreed, and not only produced an ending screen (inspired by the Amiga/ST ending), but also finished the (believed to be incomplete) loading screen, in the style of Ash. As a bonus, Joachim Wijnhoven and Neo very kindly composed a brand new tune to accompany a specially produced end sequence to round the game off and make it complete. Hopefully as close as possible to how it could have been, had been released by Hi-Tec back in the day. So for our 2000th GTW entry, we are very proud to present yet another long lost Hi-Tec game in a fully playable state. We hope you enjoy it, and here is to many more recoveries in the future! An absolutely fantastic find and amazing work by the extended coding team.